Studies put moving house amongst some of the top most stressful life experiences there are. But if you find a change of environment trying then consider how confusing it must be for your pets! 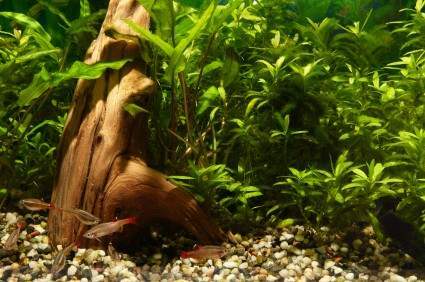 We often hear about territorial animals such as dogs and cats struggling to accept their new home but the logistical challenges of moving house with a large aquarium, not to mention the process of transporting the fish, maintaining good water quality and safely reintroducing them, can require a lot of forward planning. The safest way to move the aquarium is to effectively dismantle it and transport all of its components separately. Here are some step by step ideas on the best ways to do this whilst causing as little disruption as possible to its inhabitants. The temptation to pick up a tank and move it with everything in it may be great, but this is wholly impractical, probably impossible and very unsafe to both the fish and those transporting it. A tank should be completely drained of all its contents including any ornaments, gravel, electrical equipment (which should be turned off to cool down at least half an hour before being taken out) and water before moving - although it is beneficial to try and save as much of the water as possible in an alternative container. The tank and its contents should should be carefully wrapped with bubble wrap, blankets or any other protecting covering to avoid any cracks in transit and carefully secured into the moving vehicle. Consider taking out a good insurance policy in the event of any unexpected and costly damage both for the tank and the fish. It is also important to consider in advance where the tank will go in your new home. Its position should be in an area of moderate but not excessive light, where the temperature is fairly regular to avoid excess algae growth. It should also be situated away from sources of loud noise such as televisions and stereos which may cause distress to the fish and cause health problems. Ideally emptying and moving the tank should be one of the last things you do in the moving process in order to minimize the time that the filtering system and fish are out of the water. As an aquarium owner you will already be aware that good water quality is imperative to the health of your fish and getting water to a high quality level isn't as simple as merely running a tap. For this reason it is helpful to save as much existing water as possible from the tank and transport it in a water barrel or other suitable container. But transporting vast amounts of water isn't always practical or possible so when you begin refilling the tank it is important to turn the heater up a little and reintroduce the filtration system so that the new water warms and adjusts quickly. You may also choose to add an agent to reduce levels of chlorine, ammonia and nitrates that can be found in tap water before reintroducing the fish. Of course you can continue to monitor and test the water levels if you are concerned following the move. The filtration system is arguably the most important part of an aquarium and certainly the key to maintaining good quality water for the fish. Filtration systems can be complicated but essentially they harbor good bacteria which needs to be kept alive in order to keep the water levels healthy. Transporting them can mean losing some of this bacteria so ideally try and keep the filter in a separate container to the other tank equipment and surround it with existing water from the tank. Keeping the water well oxygenated by using a simple air pump can also be helpful as bacteria needs oxygen to survive. The most precious cargo is, of course, your fish and you need to take special care when transporting them. Do not feed them for up to 48 hours prior to the move as this will minimize the amount of waste that they are able to pass into the unfiltered water they travel in. Plastic bags and ties can be picked up cheaply from pet or marine stores and you may also be advised to use polystyrene boxes to hold the bags as these regulate temperature (particularly important for tropical fish) and also provide a little additional protection. When you have reached your destination and the tank is set up as detailed above, do not simply whip the fish out of their bags and into the tank - the sudden exposure to light and change in temperature (however small) can cause massive shock to them. Instead gradually remove them from their boxes, keep the lights of the tank turned off initially and use a thermometer to test the temperatures of the water until you feel that they are close enough to reintroduce the fish. In the coming days keep a close eye on your fish, monitor their behavior and ensure they are feeding properly. If you have any concerns about their health or the water parameters then contact a marine specialist for advice.